At Arun Vet Group, we’re proud to say continuity of care is one of the hallmarks of our practices. What do we mean by continuity of care? Simply put, we believe you and your pet should see the same trusted faces and be assured a gold standard level of treatment and communication throughout your relationship with us. Continuity helps pets and owners feel confident and reassured, which is why we ensure, wherever possible, you’ll see the same vet for the duration of your pet’s treatment. We actively encourage clients to choose a vet with whom to build a one on one relationship. This enables you and the vet to build up a rapport and you can be assured they have a thorough and immediate familiarity with the individual requirements of your pet’s health needs. It means you’re guaranteed to receive a clearly explained diagnosis and care plan. As we believe in timely and personal delivery of results – where possible, you’ll get them the same day. As part of our commitment to continuity of care we ensure you discuss your pet’s results with the same person you initially saw. Continuity of care extends beyond just the vet / client relationship. Our dedicated practice nurses and receptionists are long term employees who understand the value of building one on one relationships with clients. Not only that, they love it too. Ask any of our team members at one of our independent, family-style practices and they’ll tell you it’s one of the perks of the job! “As a receptionist at Arun Vet Group, I’m always very aware of the part I play in our clients’ continuity of care. Every team member plays a part in it. Mine is maintaining excellent administration, which means ensuring good appointment availability, short waiting times, a personal phone manner and a warm and friendly welcome. All of these things contribute to our individual client’s experience and I think they really appreciate it.” Debbie May Receptionist. 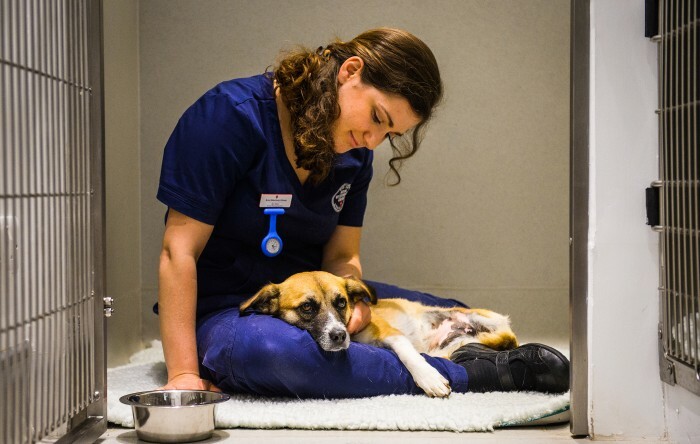 “As a veterinary nurse, I think continuity of care goes hand in hand with well qualified, technically competent clinical staff. Those of us who are really passionate about caring for pets understand that our role is so much more than providing individual treatments. We are personally invested in each and every pet we care for.” Chloe Emmerson Registered Veterinary Nurse. But it’s not all about us. Continuity of care is a two way street and a shared responsibility. We actively work with our clients to ensure pet health is a day-to-day priority so that outside the practice environment they’re provided with the tools and insights to be the most informed and responsible owners they can be.